He wasn’t a movie star. He wasn’t a famous athlete or the latest singer whose catchy ditty momentarily captured a spot in the charts and teens’ hearts. And yet, there it was. At Lakefield College School, tucked in the woods by the lake about halfway between Toronto and Ottawa and, in the 1940s, also halfway between 19th century British elitism and 20th century Canadian ruggedness, a boy took a knife in hand. In the windowsill of the little library he carved the name Percy Nelles. The other boys, and at that point the school was all boys, understood. Nelles awed. He inspired. Nelles had been one of them but now belonged to the world. Teachers turned a blind eye to the vandalism for they understood too. And so as they passed the window each day the boys glanced down, some whispered the name, and in silent reverence many drew fingers over the defiant tribute. Nelles had been a Lakefield student when the school was young but the values upon which it would thrive were already firmly established. He was a skilled cricket player and an enthusiastic member of its army cadet corps. Upon graduation in 1908, he joined the Fisheries Protection Service. With the creation of the Canadian Navy in 1910, Nelles became a midshipman in HMCS Niobe. Promotions came quickly. He enjoyed service in many ships and during the First World War at the navy’s Nova Scotia Head Quarters as flag lieutenant and director of the Naval Service. Peacetime saw the navy shrink but his career flourish. Nelles was captain or commander in a number of ships and served at the Imperial Defence College. In 1934 he became Canada’s chief of naval staff – the first Canadian-born and trained to do so. Four years later, with Hitler’s mad ambitions about to plunge the world back into war, Nelles was promoted to rear admiral. Nelles had not forgotten his old school. He played an instrumental role in an initiative that in 1939 saw the Canadian Navy officially recognize the newly formed Lakefield Royal Canadian Sea Cadet Corps (RCSCC) St. George – Canada’s only school-based sea cadet corps. Boys were divided into four platoons and a band. In crisp blue uniforms they trained for a half hour or more each day, learning skills needed to become naval officers. For five years they also enjoyed sessions on Georgian Bay’s Beausoleil Island. They knew that Nelles had helped establish the Sea Cadet Camp facilities and its fun but rigorous program. 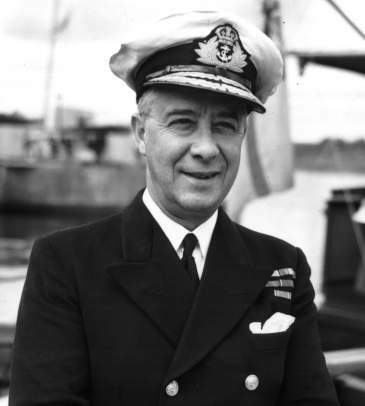 Meanwhile, Nelles was reassigned to Britain where, as the senior Canadian flag officer overseas and head of the Canadian Naval Mission, he oversaw the Canadian Navy’s preparations for the June 1944 D-Day invasion of France. He coordinated 110 ships, 10,000 sailors, and 15 air force squadrons for the successful landing of 14,000 Canadians on the heavily fortified Juno beach. D-Day was the turning point in the war that reminded all that evil is sometimes incarnate in a man or movement. Evil’s enemy can sometimes be a kid from a Saskatchewan farm, or Calgary street corner, or even a little school in Lakefield. The library is gone now. The space became a classroom, then staff room, and is now a slick new Admissions office. But the windowsill is still there and so may also be the boy’s carving that was so simple and yet represented so much. It is the same simplicity represented by the little poppies we wear each November. They express our devotion to those who offered their full measure of devotion for causes perhaps forgotten but in support of values that endure. They proclaim our insistence that the sacrifice and service of those who died, of those who returned whole or broken, and of those still in uniform, shall not be forgotten. Our remembering is as simple as the little felt poppy, or the windowsill carving, but as complex as citizenship itself. For a few days each year we are asked to transcend our lives’ minutia and the exhortations of some politicians and all corporations and become more than voters, taxpayers, and consumers. We become citizens. And as citizens we bear the burden of remembrance. To remember all who served is overwhelming and so this year I will offer respect for all by remembering one. This year I will remember Percy Nelles. In my moment of silence on the 11th at 11, I will curse war but revere the warrior. I will hate the hypocrisy, greed, and stupidity of wars of choice but honour the value of service-above-self. But even this is too easy. Perhaps his memory is better honoured not by a forgotten carving or soon discarded poppy. Maybe this year we can summon the courage to act as Nelles did, as they all did, and let the values that inspired their service more fully inform our lives. These are the values, the essence of informed, engaged citizenship, that we saw on vivid display in Canada’s recent election. We see it every day in the acts of selfless volunteers. We see it in those whose courage and convictions broaden the circle of community. We see it through actions that demonstrate not just tolerance but acceptance and by acts and attitudes that show a willingness to trust a little more and take a little less. Engaged citizenship is hard. It is a hell of a lot harder than wearing a poppy for a few days or standing silent for a minute a year. But let us compare the challenges of engaged, values-based citizenship to the difficulties and sacrifices of those for whom we don poppies. Rear Admiral Nelles, this year, I pledge to do my best. A pledge to be made to all the ‘Percy Nelles’ of the world!